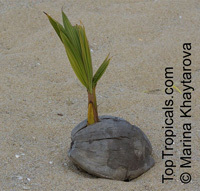 Flood tolerant. 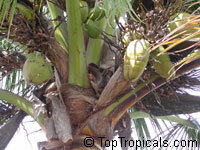 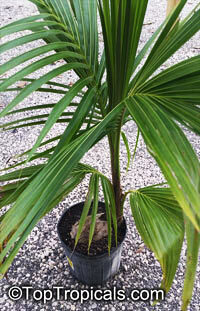 "Symbol of the tropics" often used as a houseplant. 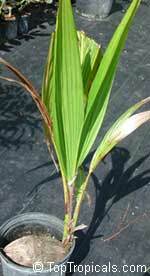 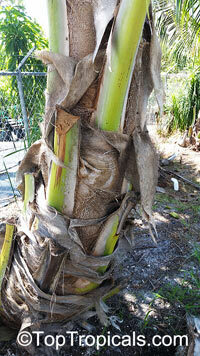 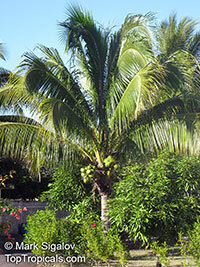 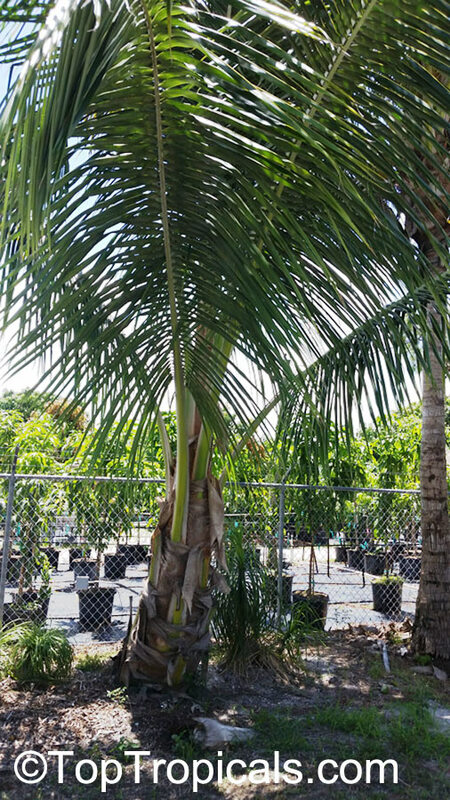 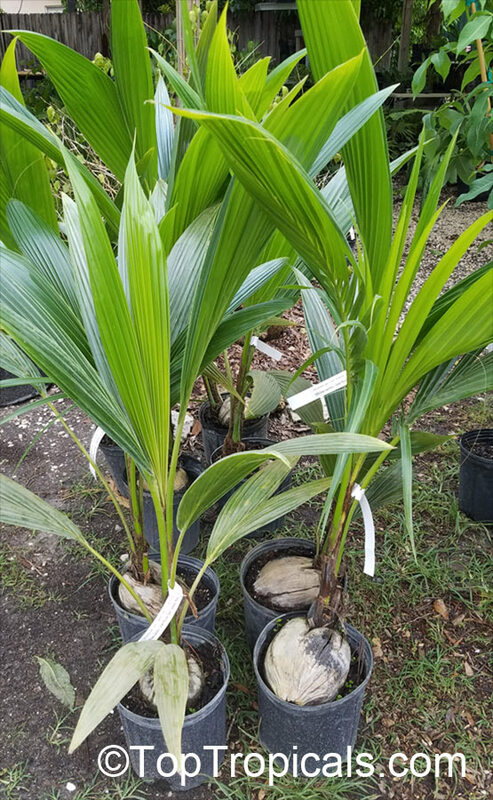 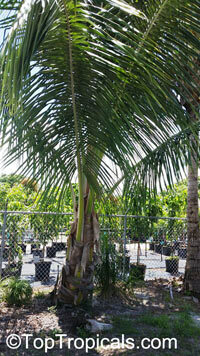 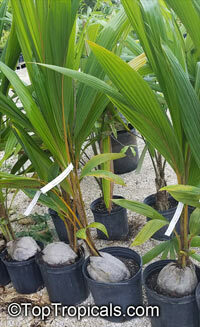 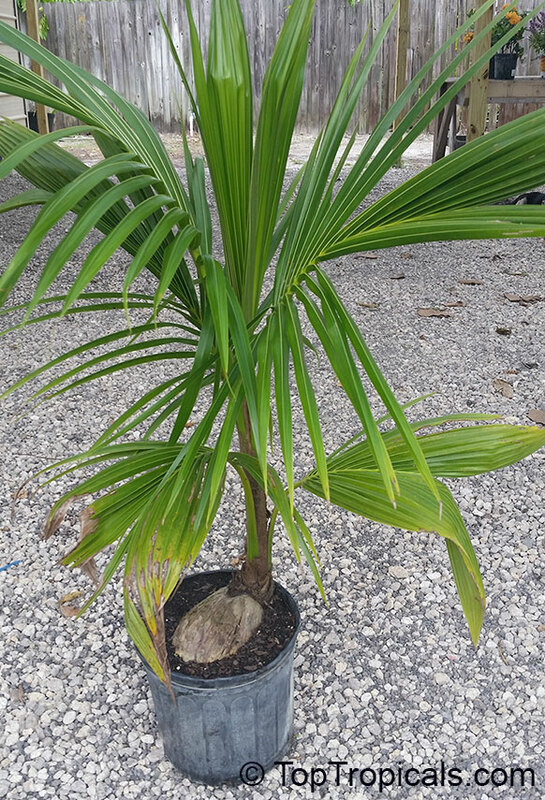 Fast growing palm proven to help clean indoor air of smoke and harmful chemicals. 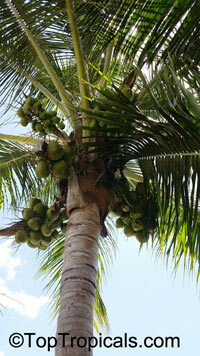 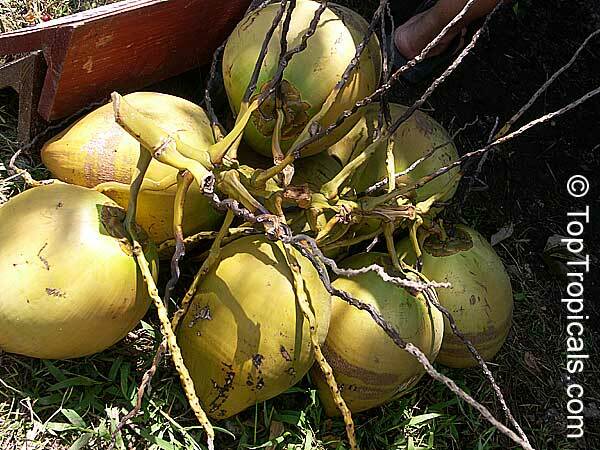 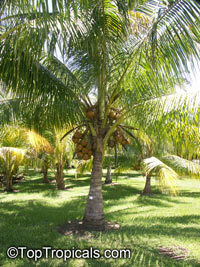 Bares coconuts 12 months a year for fresh coconut milk and copra (dried coconut). 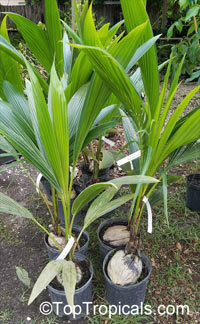 Varieties: Green Malayan (thin trunk), Mayton (thicker trunk, longer leaves, more hardy). 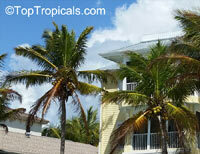 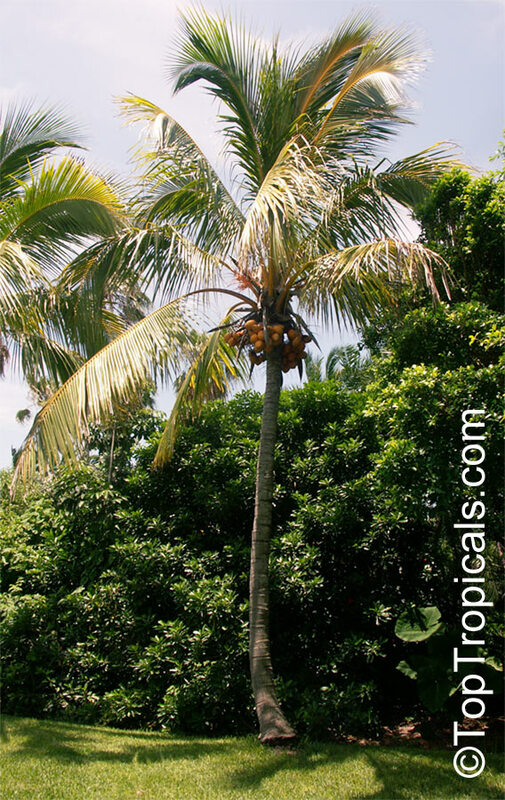 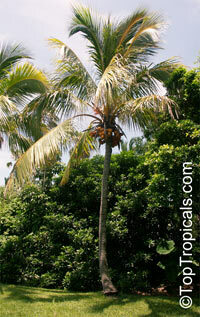 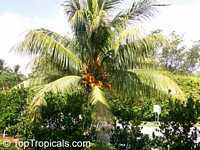 This very tall palm tree is always an inviting symbol of the tropics. 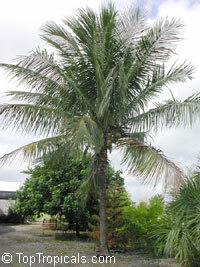 The plant is one of the most valuable plants to man. 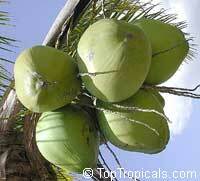 It is a primary source of food, drink, and shelter. In Sanskrit the coconut palm is called "kalpa vriksha", which is defined as "the tree which provides all the necessities of life." 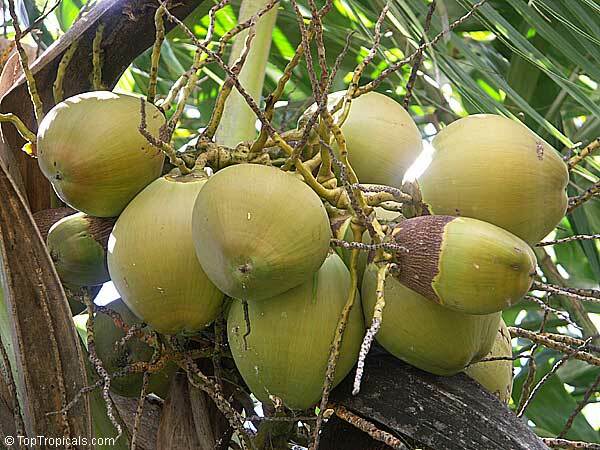 Man can use every part of the coconut. 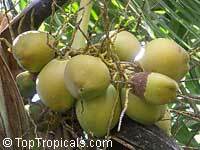 The white nut-meat can be eaten raw or shredded and dried and used in most cooking recipes. 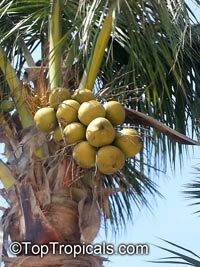 A single coconut has as much protein as a quarter pound of beefsteak. 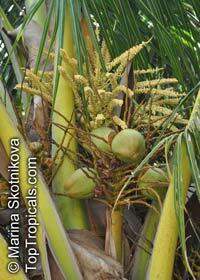 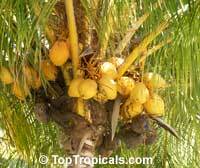 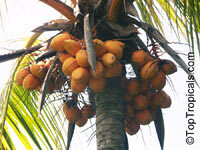 Copra, the dried meat of the kernels, when crushed is the source of coconut oil. 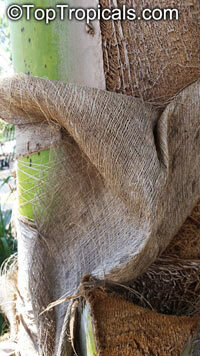 The husks, known as coir, is a short, coarse, elastic fibers used to make an excellent thatch roofing material for houses. 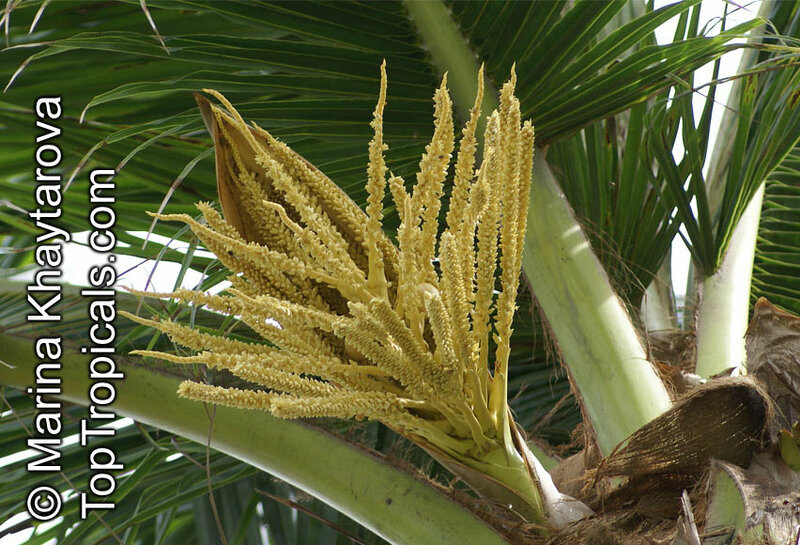 This very diverse plant is also an excellent charcoal, which is produced from the shells, not only does it work as a cooking fuel, but also in the production of gas masks and air filters. 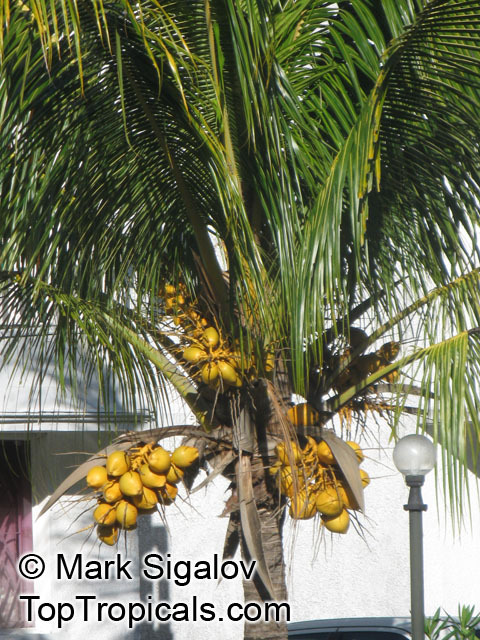 The outer part of the trunk of the coconut palm furnishes, a construction lumber, known as porcupine wood for houses and furniture. 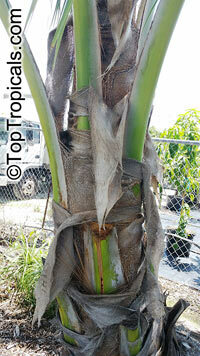 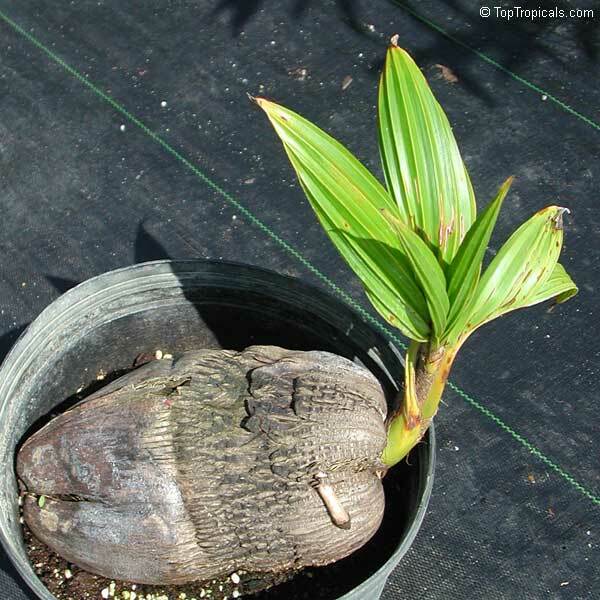 The swollen base of the trunk, when hollowed, can be turned into a hula drum that the Hawaiians use for entertainment. 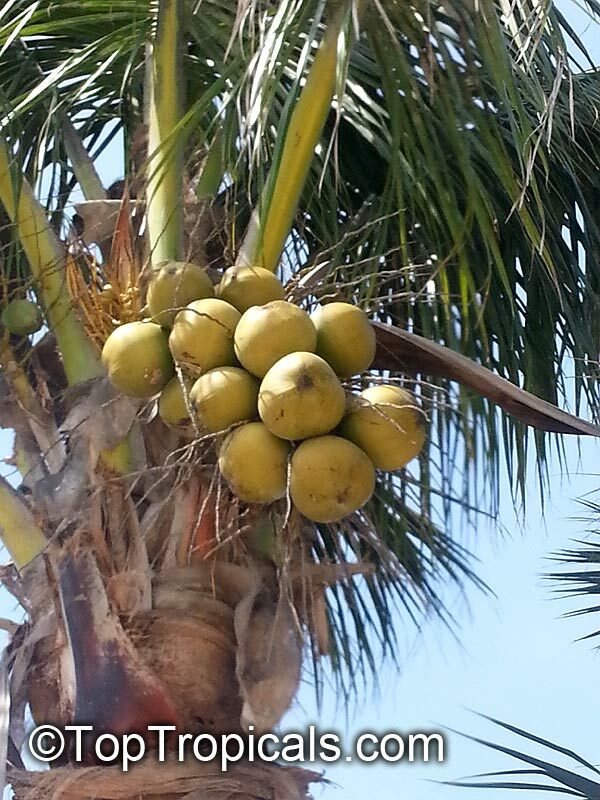 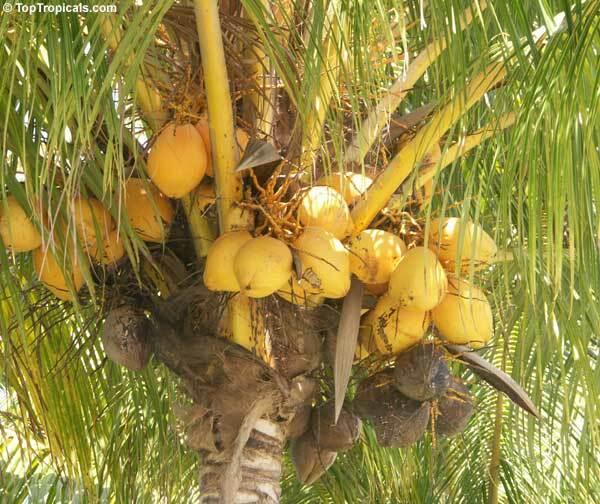 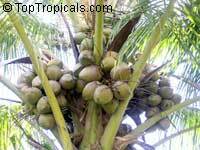 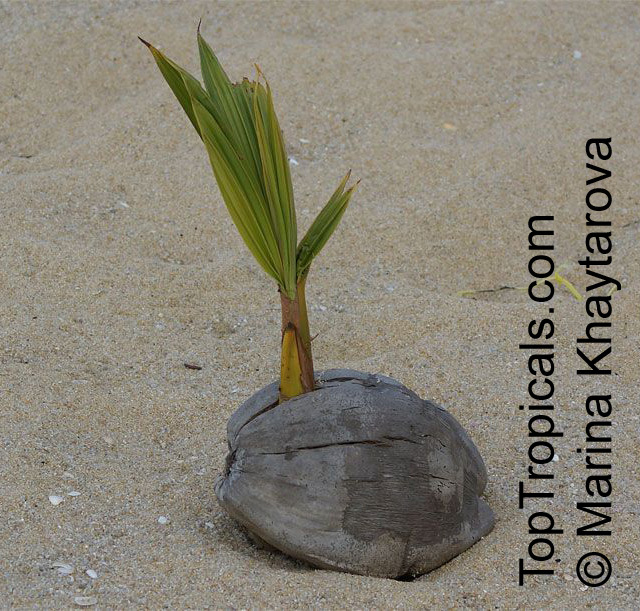 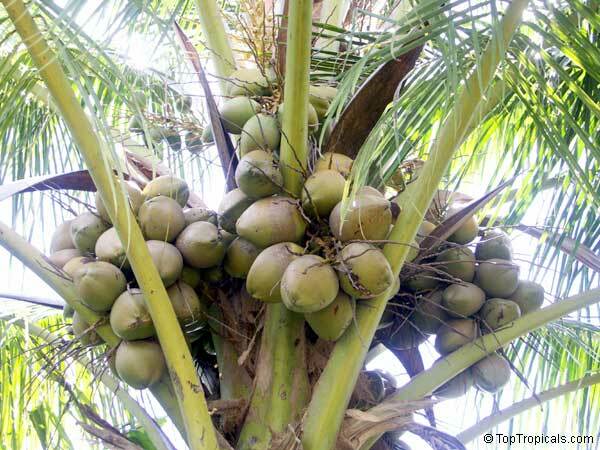 These are just a few examples of how extraordinary the coconut palm can be utilized. 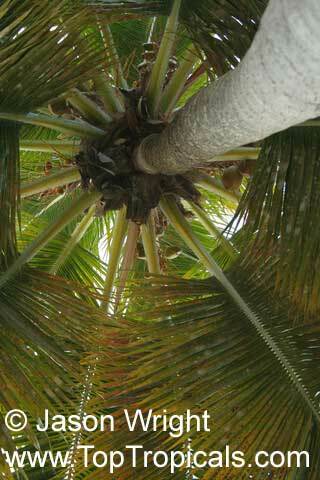 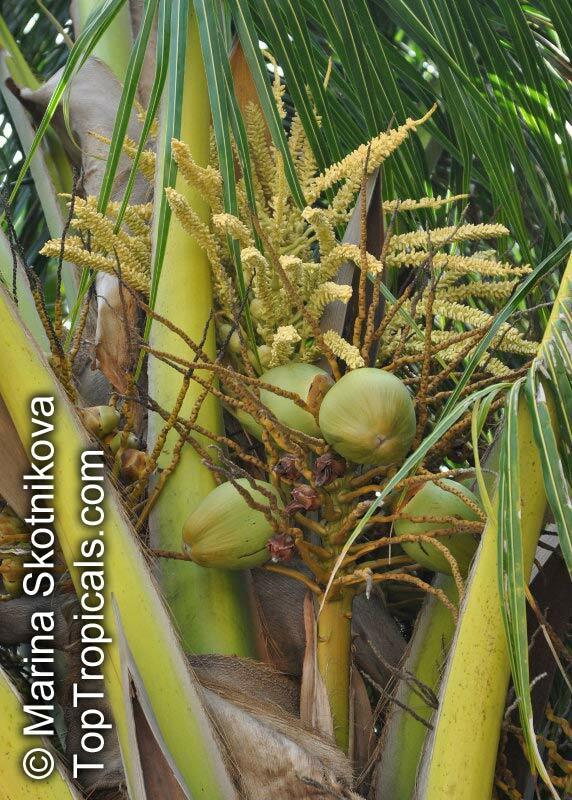 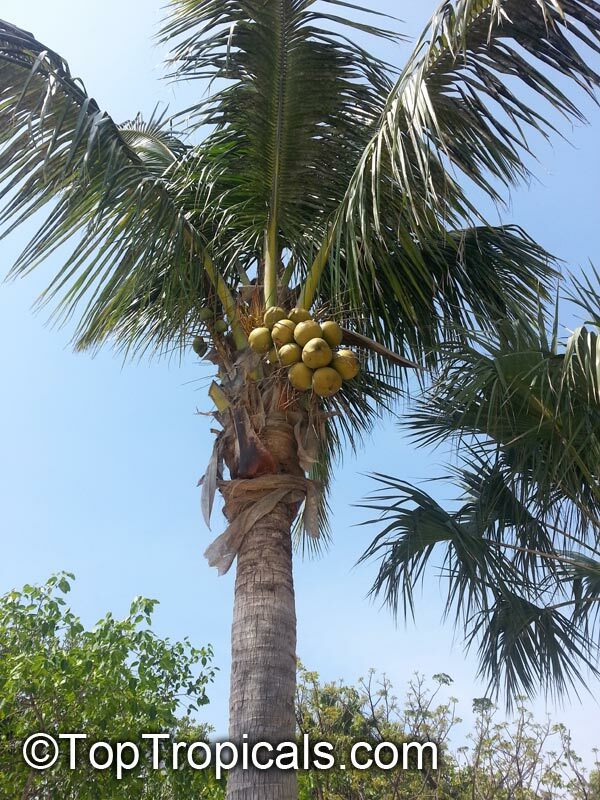 Coconut palm. "Symbol of the tropics", often used as a houseplant. 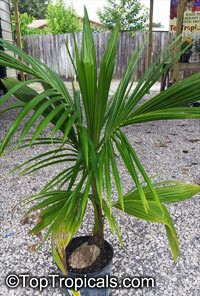 Fast growing palm proven to help clean indoor air of smoke and harmful chemicals. 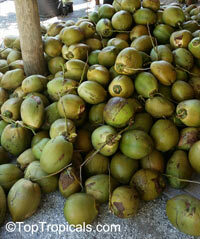 Bares coconuts 12 months a year for fresh coconut milk and copra (dried coconut). 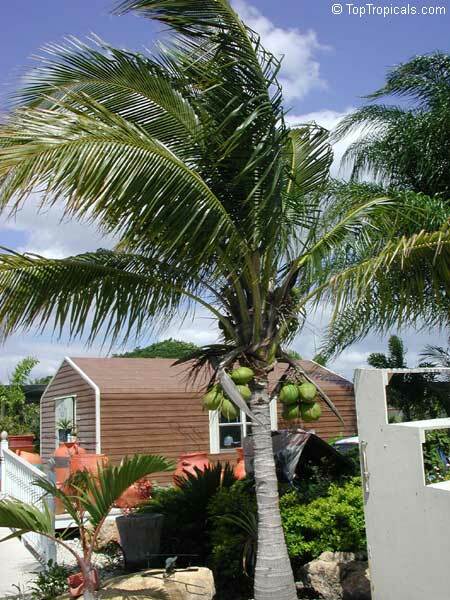 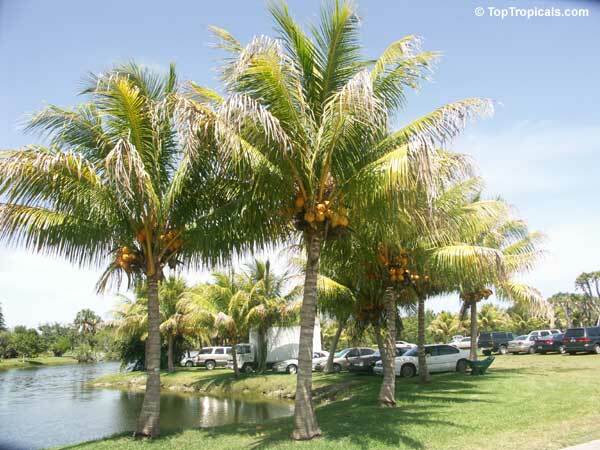 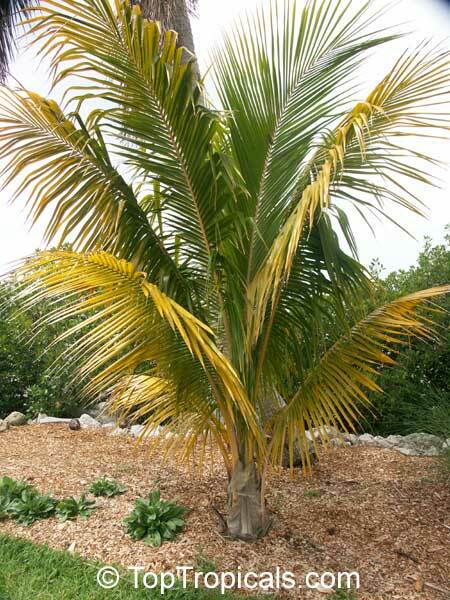 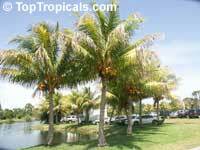 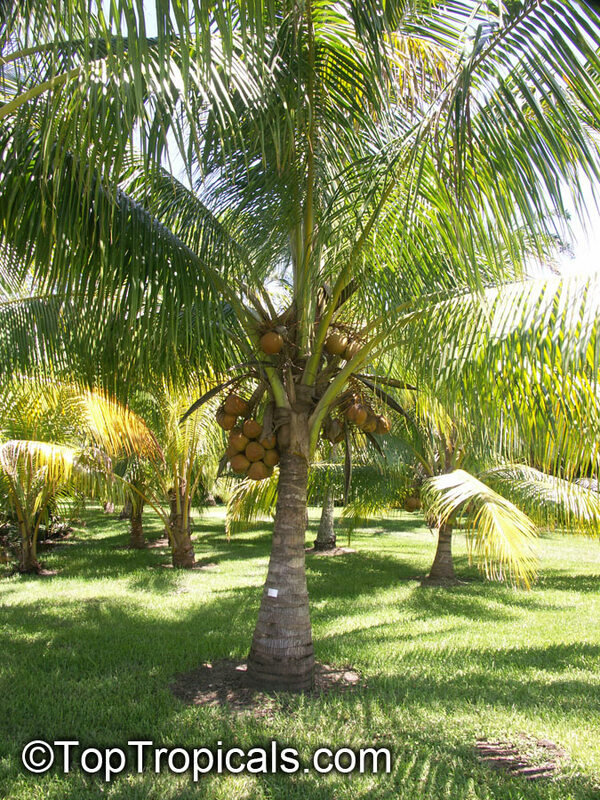 We do not ship coconut palms to CA, TX, AZ, LA! 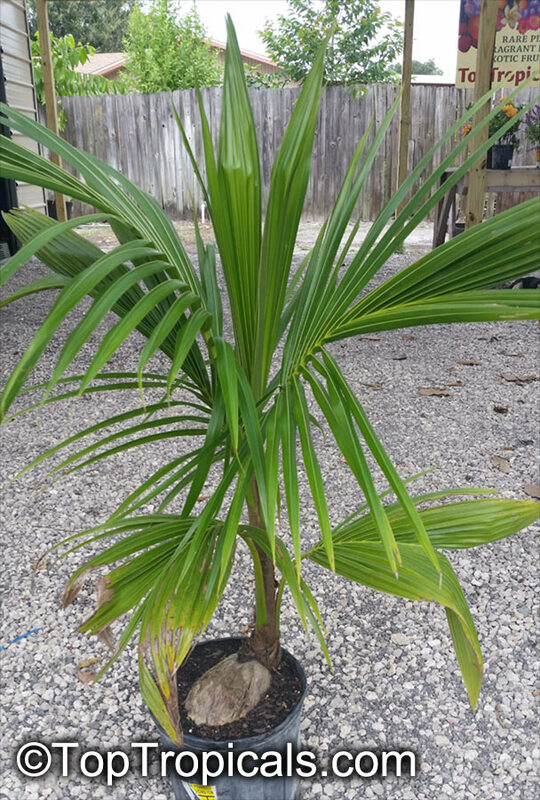 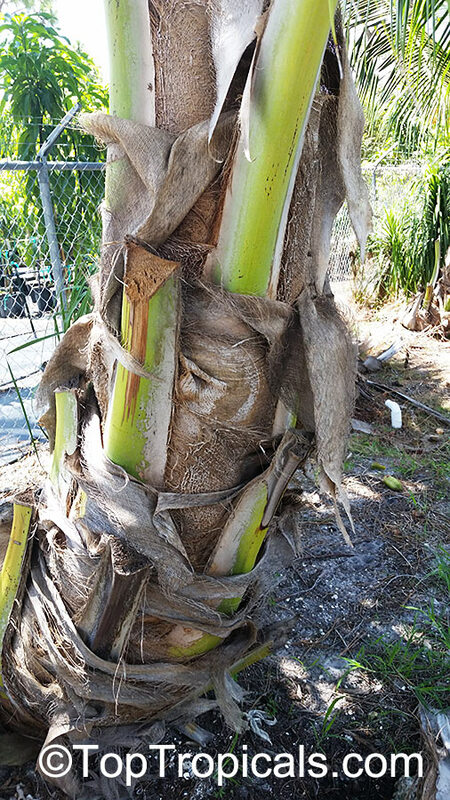 RECOMMENDED FERTILIZER: Purple Palm Food - Smart Release Palm Booster.This item is not certified for shipping to California. Smallest tree grown in FL, will fruit when there is 5 feet of trunk. 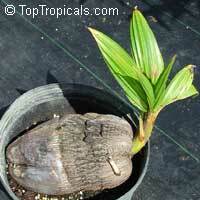 This variety is resistant to fungus.